Viscosity is an important factor in quality of some products and some people mistakenly think that a more viscous liquid contains more active ingredient. For example consumers may think that a viscous liquid detergent has more cleaning power than the one that is not as viscous. A similar misconception may exist about paints, jams, some drinks and many other products. Quality control departments of many manufacturing facilities continuously check the viscosity of their products to ensure a consistent viscosity in different productions of the same product. In this project you will compare the viscosity of different household liquids or different oils such as motor oils. 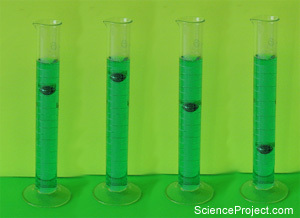 Your experiment results will show relative viscosity of different liquids. You will present your results with tables and graphs. More details or support for this project is available for the members of ScienceProject.com web site. Material needed for experiment or a science kit about this title may be available at MiniScience.com or may be purchased locally.